Literacy is, among other things, about communication. Writers write, readers read, and ideas and experiences are shared. Then I started thinking about communication in all its glorious forms. What about jazz music? Specifically, improvisational, free form, impromptu jams in which the musicians carry on entire musical conversations with their instrument voices. How exactly does that work? What cues are the musicians using? How do they know when to start? When to stop? 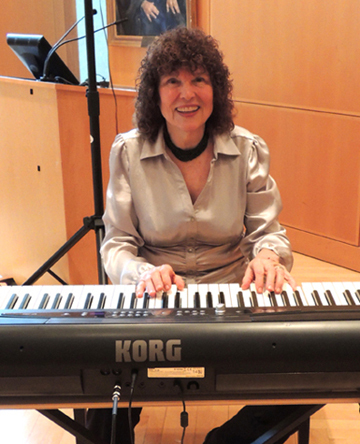 My search for answers led me to the very talented Dr. Karen Zumbrunn, jazz pianist extraordinaire, who was thrilled to bring some jazz communication to our library. 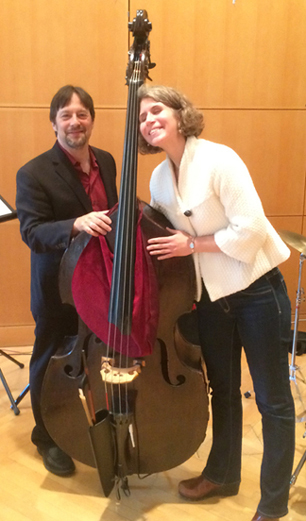 At the program, Karen was joined by Brian Glassman on double bass and Tom Sayek on drums. All I can say is…wow. I can’t believe what they packed into that 60 minute performance. Karen explained accents, beats, syncopation, melody, tone, changes, coda, chords, tags, and pitch. Interspersed with her instruction were jazz pieces that not only demonstrated the concepts she was explaining, it also got the kids singing, clapping, and dancing along! 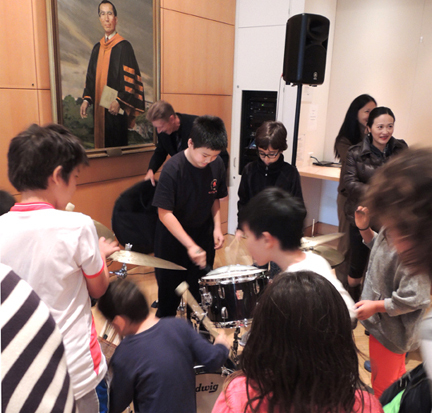 At the end of the program, the kids were invited to come up and meet the musicians and the instruments. The drum set was an absolute mob scene. But, as a former bass player, I made a beeline for the double bass. It was made in Concord, New Hampshire by Abraham Prescott circa 1820. Love. Loooove. Later, I caught up with Karen to ask her a little more about jazz communication. Upon my return from Paris I entered the MA program at Ohio State University and my master’s thesis, “12 Blues of Charlie Parker” was the first one at OSU on jazz. My other love is teaching so I got a second Masters in Education. I completed my Ph.D. at the University of California at Berkeley, incorporating jazz into part of my dissertation. 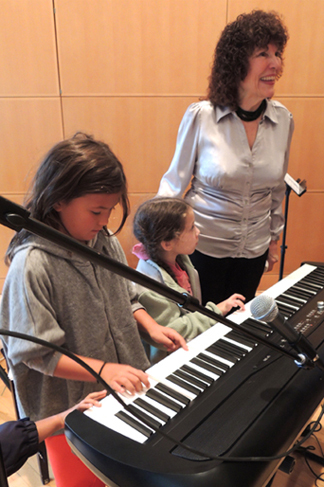 My life has been filled with my love of jazz and of teaching. I was an Associate Professor of music at Bergen Community College and also taught at Rutgers, Middlesex Community College, and Mercer Community College. 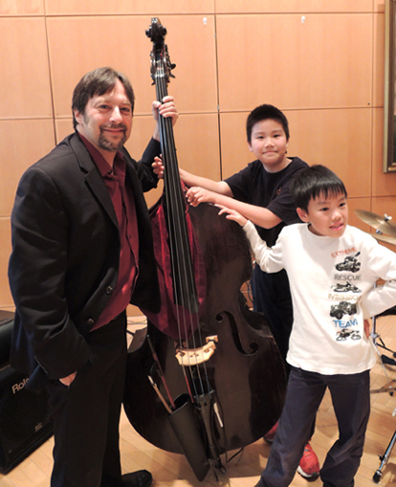 How did you decide to present jazz communication to kids? Libraries are all about communication – through the written word and illustration. I was aware of some of the many fine programs Dr. Dana had offered in the past – from the Japanese storytelling to other activities. In discussion with Dr. Dana, we explored the idea of presenting jazz as another form of communication. We wanted to present pieces that were in a fairly bright tempo. Dancing, clapping, moving around was encouraged. There is no jazz experience without with players and an audience in communication. Jazz is fun! There was a bit of singing (and dancing!) during the program. Why did you decide to add a singing component? 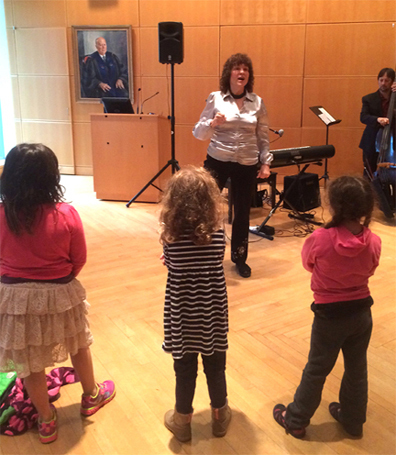 I have performed in many library and school situations. I like to have the audience sing a folk song that is not too complicated – then they can follow the improvisations and creations the jazz musicians present. Our goal is always to make jazz less of a mystery so even children will not be afraid of the word “jazz” and will open their ears. Who are some of your favorite jazz musicians? There are so many fine jazz musicians, past and present, on every instrument – too many to mention. From the piano sounds of a Les McCann, Bud Powell, Erroll Garner, McCoy Tyner, Hank Jones, Tommy Flanagan to the smooth cornet of a Bobby Hackett or swinging sax of a Cannonball Adderley, the list of talented artists would take several pages. 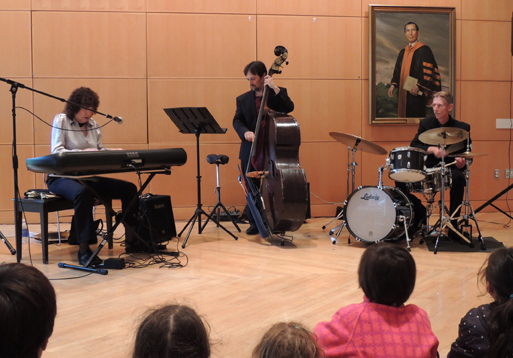 There are fewer places to hear and perform jazz now than some years ago – so the library did a major service to the community by offering this free program.